They represent 20 percent of your workforce, but do 80 percent of the work. These are your high-performing employees whose can-do attitude and recognized expertise in their particular area of your business consistently produce results. So, is promoting them to management the right move? Companies make a costly mistake when they assume the only way to retain high-performing employees is by promoting them, Powell said. An even bigger mistake is basing promotions on how well employees do their current job, instead of their skill set for the new position. Worse yet is to place someone you want to groom for management on the “leadership track” without getting any input from them. Powell said high-performing employees who don’t aspire to the corner office can be motivated by new and challenging projects, opportunities to share their expertise, face-time with management and other forms of recognition. Small tokens of appreciation for a job well done are effective, but only if the boss first makes an effort to find out what the employee’s outside interests are. “Don’t give baseball tickets to someone who doesn’t like sports,” Powell said. The point is to make the high-performer feel appreciated, not annoyed that you know so little about them. Laurence J. Peter, who nearly 50 years ago formulated the management concept known as the Peter Principle, warned that if companies keep promoting their high-performing employees to management jobs for which they are unqualified, the business will, over time, become one in which every position on the organization chart is filled by an incompetent person. “You need to have the right people doing the right jobs at the right time,” Powell said. The key is to learn how to identify high-potential employees from the rest of the high-performers, she said. A high-potential employee needs to know that the boss is thinking about them and their future role in the organization, Powell said, noting this needs to be an on-going dialog, not something conveyed only once a year as a part of an annual performance review. Motivate high-potential employees with greater visibility, cross-training, a clear career road map, mentoring, and consistent encouragement and support, Powell said. Above all, be patient. It takes at least two to three years for someone to develop the skills needed for a senior leadership position and there will be failures along the way, Powell said. 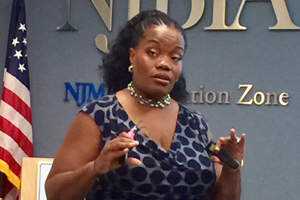 Krishna Powell is a principal at HR 4 Your Small Biz, an HR consulting firm based in West Trenton that provides HR audits, background checks, professional development, customized workshops, strategic planning and mediation. For further information, Powell can be reached at 609-436-9363. Excellent points that drive home the principle that “Communication is Everything”. Understanding what truly motivates a person will guide management in determining who and when should be moved into leadership roles. That is done through consistent and meaningful dialogue that managers should be trained to embrace and facilitate. A great tool in that process is the use of a DiSC Assessment which combines “Motivating Forces” with “Communication Styles”. The key to motivating high performers is first to be sure their current performance is recognized. Many small business performance review practices turn off high performers because they are subjective, based on the boss’s opinion, not on objective measures. When I have introduced a performance review process based on objective quantitative and qualitative measures, the process becomes self-selective. High performers glom onto it, because they realize their good work will be recognized. Poor performers on the other hand give the excuse that their work is too complicated to be measured, because they don’t wan their work to be measured. I agree that you don’t have to promote high performers to keep them. Just properly recognize their work. Exactly Paul! Employees just want leaders to properly recognize their work. Thank you for you comments. Your insight is appreciated. All of this is so true. I wonder just how many high performers feel under valued. These old rating systems … 1 through 5, they don’t work either. If you are at the top of your wage range, for sure, the high performer gets a “3,” wondering why in the world they work while everyone else goes home.